This year was Skelmanthorpe Prospect Brass’ second visit to the Hardraw Scar Entertainment contest. 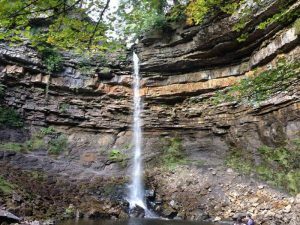 The event is held annually in the natural amphitheatre, within the grounds of The Green Dragon Inn at Hardraw near Hawes. 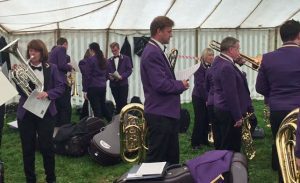 Under the baton of its MD, Phil Garlick, the band gave an all-round superb twenty minute programme performance consisting of James Swearingen’s (arr Sandy Smith) light concert piece, Volero, Harold Moss’ cornet solo, The Nightingale, John Ireland’s (arr. Steve Robson) hymn tune, Love Unknown, John Philip Sousa’s march, The Thunderer and John Williams’ (arr Frank Bernaerts) Jurassic Park. For it’s labours, Prospect Brass returned home with a cash prize and silverware for winning the best soloist prize and coming fifth over all.